Suite Sports: How Far Can Celtics Fans Expect their Team to Go? How Far Can Celtics Fans Expect their Team to Go? With Boston heading into a key Game 2 tonight against Milwaukee, Cleveland facing an early 0-1 hole in its series against Indiana, and the Sixers tied with Miami, it seems like the East might be as up for grabs as it has been in some time. So, can the beaten and battered Celtics turn this season into a run to the NBA Finals? Or, can the Celtics at least defend their way to back-to-back Eastern Conference Finals appearances? The short answer is most likely no, but the long answer is maybe, with some luck. However, that luck does not have to be injuries on opposing teams. Before you say that the Boston Celtics are doomed with all their injuries (Kyrie Irving, Gordon Hayward, Marcus Smart and Daniel Theis), both Vegas and FiveThirtyEight envision the Celtics advancing past their first round opponent, the Milwaukee Bucks, whom they already lead 1-0. Giannis Antetokounmpo and the Bucks own the league’s worst fourth quarter differential, and the last time they advanced past the first round of the NBA playoffs was 2001 when George Karl was Milwaukee’s head coach. Since then, Karl has coached for two different franchises, and the Bucks have had seven different coaches, including two this season. Current Bucks head coach Joe Prunty had never led the sideline for a playoff game until Sunday, and he is facing a battle-tested coach in Brad Stevens. Prunty’s Bucks will be headed into the raucous TD Garden on Tuesday against a hungry Celtics team that has the league’s best defense overall and best defense against the 3-point shot. The leprechaun inside the TD Garden hoops will need to help the Celtics during this postseason because of their reliance on the 3-ball: 33 percent of the Celtics’ points this season came from downtown. Of the eight Eastern Conference playoff teams, the Celtics relied on the 3-point shot the most. The only playoff team that relied on the 3-point shot more than the Celtics this season was the Houston Rockets. Although the Celtics were raining 3’s this season, their success was based on their performance from inside the 3-point line. When the Celtics shot equal or better on their 2-pointers than their opponent, the Celtics were 39-7 this season. When they did not, their record was 16-20. If the Celtics can get their shots going against the Bucks, they will have success in the series: Milwaukee was 11-25 when their 2-point percentage was worse. However, the Celtics outshot the Bucks in just one of their four meetings this season. To add insult to injury, Kyrie Irving, who made a team-high 166 shots from 3-point land this season, did play in that game and scored a team-high 32 points in the December 4 victory. The Bucks score very effectively off turnovers and in the paint, and if they are successful in both of those categories, they will have a great chance at making their first Eastern Conference Semifinals appearance in 17 years. The Bucks were the Eastern Conference’s best with 18 points off turnovers per game. What makes matters worse for the Celtics in this first round series is the Bucks’ 47 points in the paint per game this season, which ranked second in the conference. In addition, the Celtics do not defend the key (11th overall) as well as they do the 3-ball (1st overall), and they have struggled to defend the Bucks at the rim. So, as we saw in Game 1, nothing will come easy against the Bucks, though most expect the Celtics to advance. For the Celtics to make a run in the 2018 postseason, Jason Tatum and Al Horford, who own the team’s best 3-point percentages respectively, will have to lead the way. The Ringer posted an outstanding video discussing the tandem’s success on the court together, including the fact that their net rating of +7.2 would rank fourth in the NBA. Although the Celts were 8-2 without Horford this season, Boston was 17-2 this season when he made more than six field goals in a game. 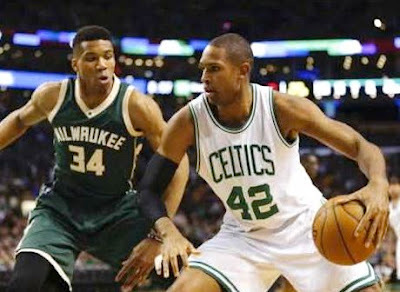 Included in those 17 wins are both of the C’s victories over the Bucks this season, including a season-high 27 points for Horford on October 26. Moving forward, Boston is in need of strong performances from the Tatum/Horford combo in addition to the likes of Jaylen Brown, Terry Rozier and Marcus Morris. Stevens has been an underdog before and although the Celtics are technically not an underdog against the Bucks, Boston will be an underdog moving forward. The Celtics, who have homecourt in the second round, had success against the Philadelphia 76ers this season and are a better team than the Miami Heat. Therefore, a return to the Eastern Conference Finals cannot be counted out for a Celtics team that no one has been able to count out this season.